Published 16/03/2019 15:15:33 from Buenos Aires, Argentina, 131 visits. 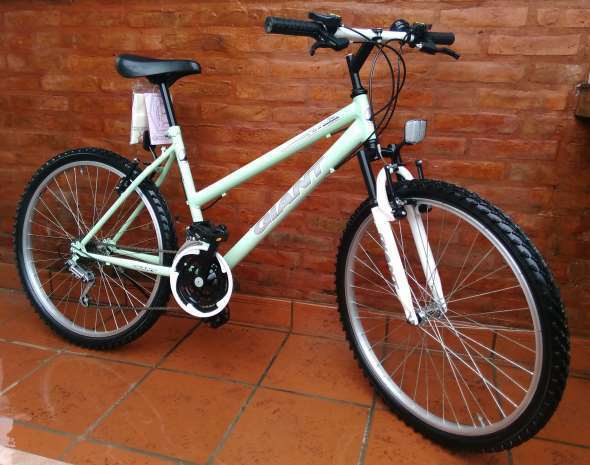 RVB bike offers bike road MTB 26, used, service full (fully disarmed and reset - see photos). Unisex steel box, size 46 (minimum height 80 cm asiento-piso). Green water. Ideal people stature or media. Clean bottom of box and all of its components. Minimum details of painting by age and use. Mechanics (address - footswitch - transmission) and system v-brakes of resin, repaired. 18-speed system of updates to friction. Fork with damping. Wheels: aluminium rings and chrome-plated iron maces; wheel cones repaired. Chambers imperial cord and covered with taco dsh 26 x 1.95 as new. Pedals of resin and light tone, new. Cat`s eye. Support foot. Copies single giant decorative way. Seafood Gift Pack. Facebook: RVB bicycles. Location: Olivos, Vicente López (North), Buenos Aires (15 blocks from Unicenter shopping). RVB bicycles is not local to the street. Call to arrange date and time of purchase. Not low price. No swap.